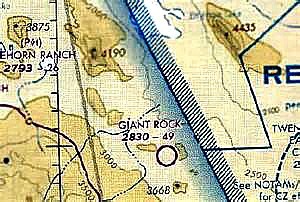 The GIANT ROCK UFO CONVENTION: LANDERS, CALIFORNIA, was the brainchild of genius or madman or even con man, GEORGE VAN TASSEL, you be the judge of who this man was. 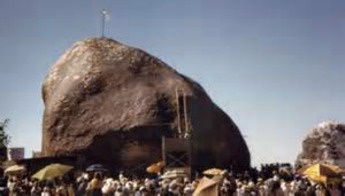 One place where UFO MANIA hit its apex was the Giant Rock in Landers, California. 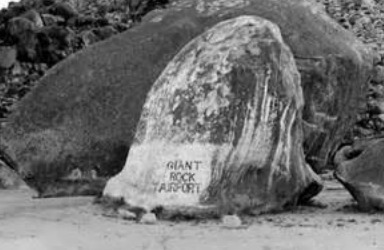 The Giant Rock was home to 17 Wild UFO conventions, these meet ins were Woodstock-esque. 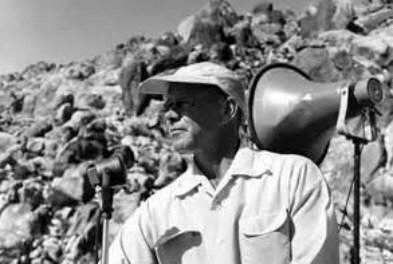 The man who made these UFO shindigs happen was George Van Tassel, who also claimed to be a UFO contactee. 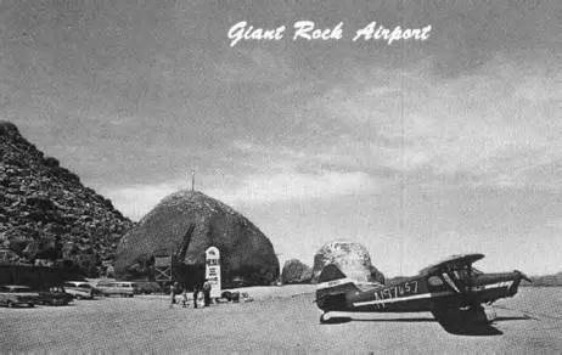 Van Tassel operated an airport at the Giant Rock, he was also at one time a confidant an employee and private pilot for Howard Hughes. 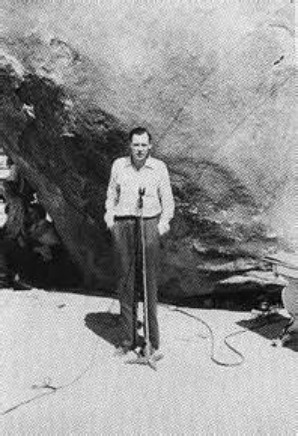 Van Tassel claimed to have been given information by a Venusian at the Giant Rock one night. 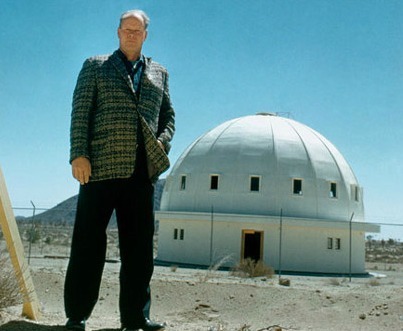 After this encounter Van Tassel started building his INTEGRATRON in Landers, California which is close to the Giant Rock. 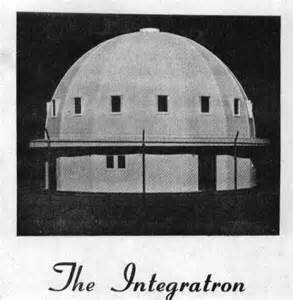 The INTEGRATRON was a device that was built into a domed building. 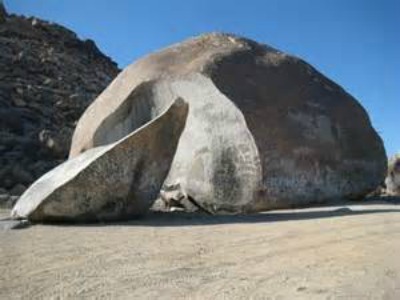 The building's dome would spin as electric current would fill the large room under it. This machine was supposed to revive the human being that was inside the building by way of electrical charges. 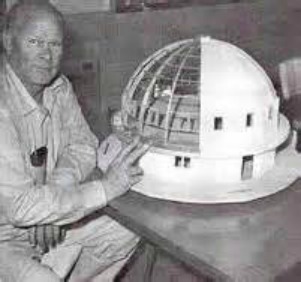 Unfortunately Van Tassel died before the project was completed and no blueprints were found. 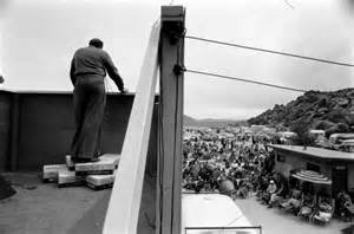 Conspiracy theorists claim the blueprints were stolen or that Van Tassel was killed because he was on the verge of a breakthrough that would destabilize the control the governments of the world had over people. Through the INTEGRATRON the mysteries of new energies would be revealed. 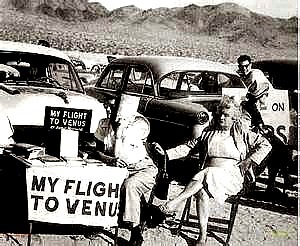 Others claim Van Tassel was a con man, the money he collected for the INTEGRATRON and the UFO conventions went to finance his travels and indulgent good life. 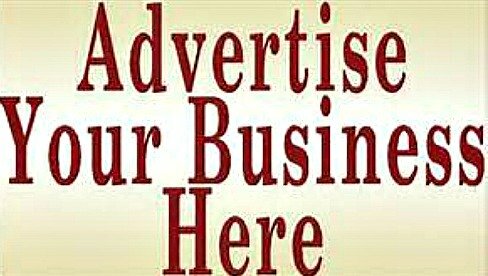 GEORGE VAN TASSEL = SOME OLD RECORDINGS --THEY DO HAVE SOME MERIT -- CLICK HERE. 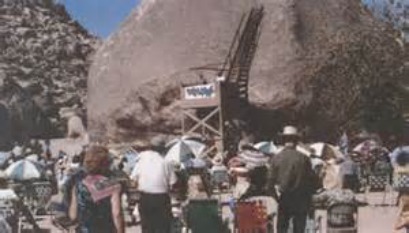 -LEFT ---- The the man in the 1968 tower is Van Tassel. 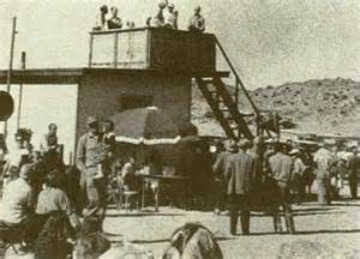 When the tower was first built it had no sun canopy, eventually one was installed. 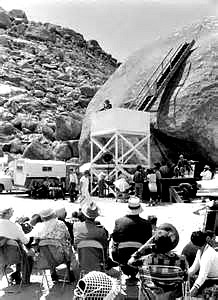 BELOW THE 1968 CONVENTION PHOTO: is Gray Barker 1925-1984, who addresses the crowd in 1956 in front of the Giant Rock, this was before the tower was built. 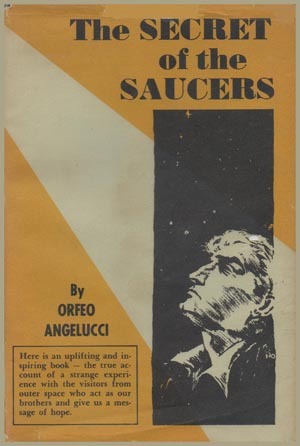 Barker was a famous UFO writer in the 1950s and 1960s. 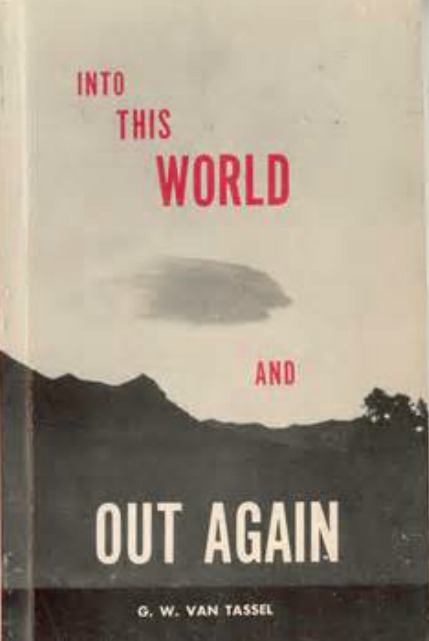 Barker was an odd fellow at first he was a darling of the UFO community, then he was discredited for his hoaxes, however--there seems to be some truths in some of his research. 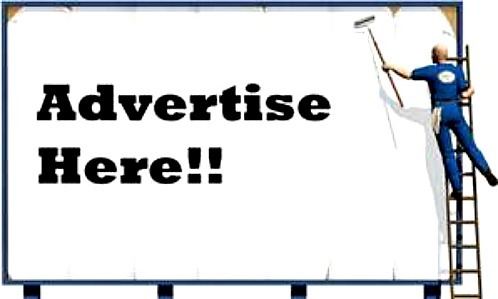 According to some UFOLOGISTS--- Barker was a paid misinformation specialist. 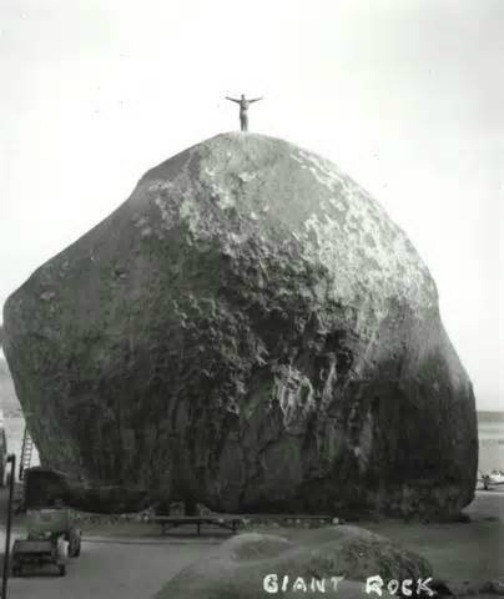 The Giant Rock conventions drew all kinds of people, the serious, the weird, the lost, the scholars and the capitalists. 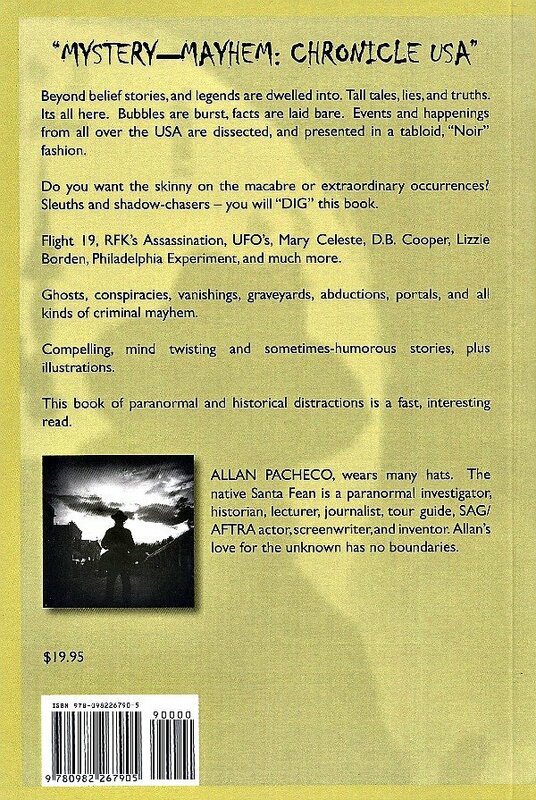 All kinds of things were sold at this UFO gathering, food, drinks, books, and ?????? 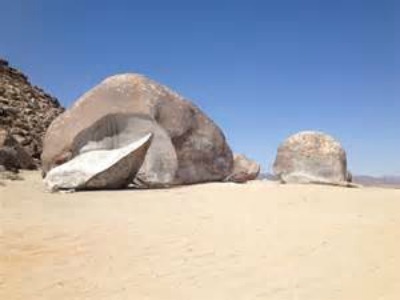 The Agnostics claim NON REALITY was sold at the Giant Rock roundups. 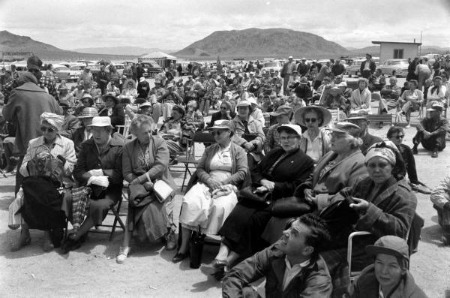 The crowds at this convention were huge and the gatherings happened in the desert! 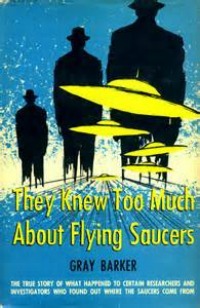 UFO MANIA 60-50 YEARS AGO! 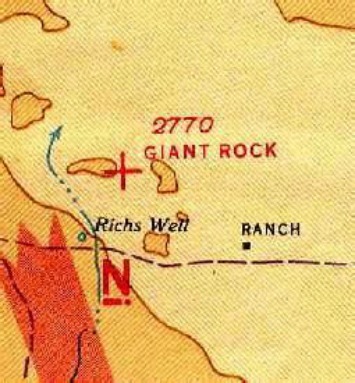 At the start, the 1950s; these GIANT ROCK conventions were attended by mainly mature people. By the 1960s the crowds consisted mainly of middle age or younger. With the crowd age changing so did the convention's energy. 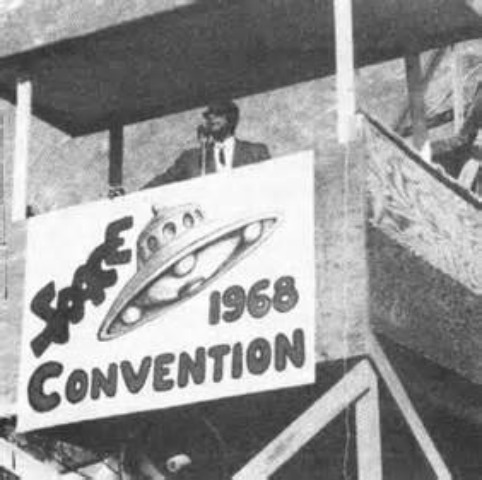 By the 1960s the conventions became a HAPPENING. 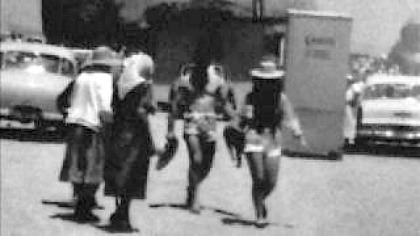 SILENT FILW WITH SOME SKYDIVER ENTERTAINERS - CLICK ON ICON. 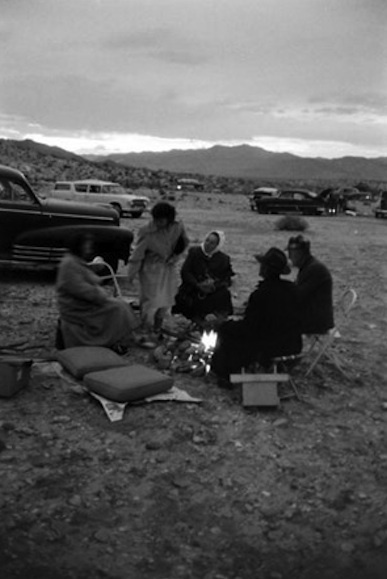 The conventions were first held in early spring or in he autumn, this led to people having to bundle up to fight off the desert cold. 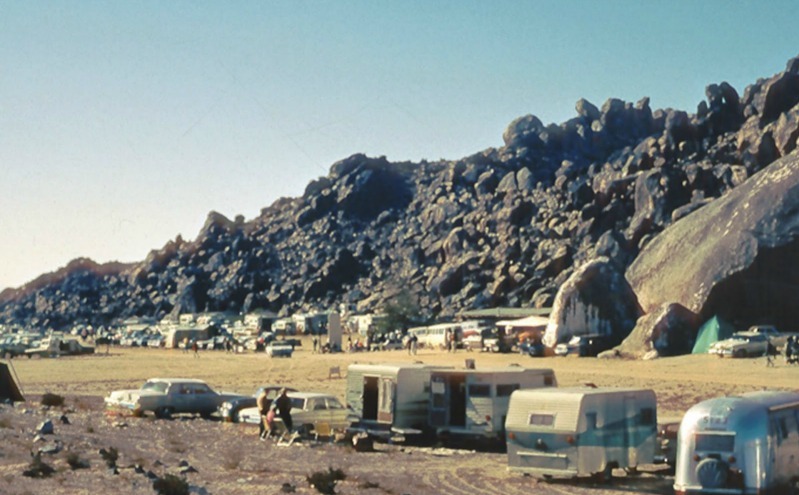 Yes, it does get cold in the desert during the early spring and late fall. 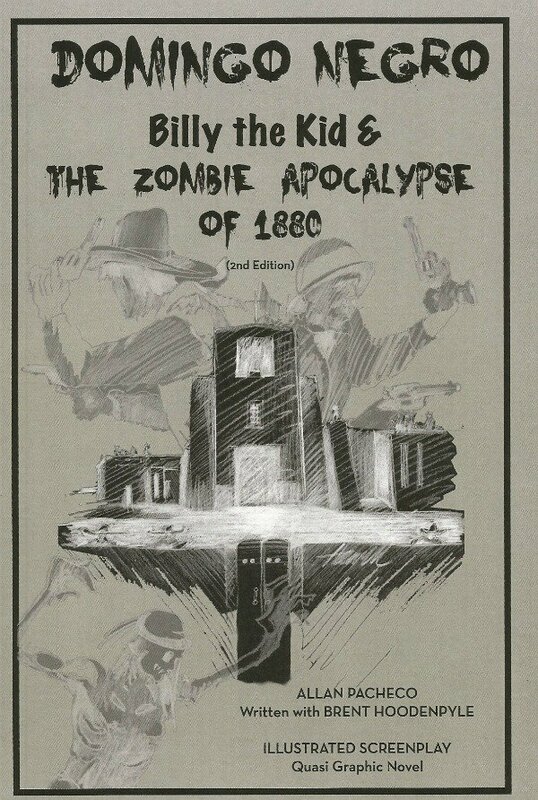 Later on the shindigs were held in the summer months. 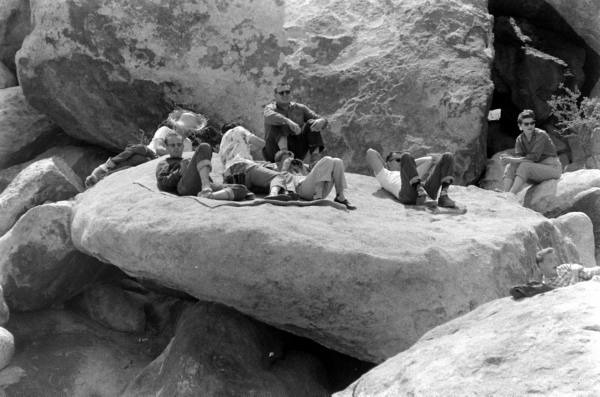 THE GIANT ROCK SHINDIGS EQUALED// CAPITALISM AND FUN! 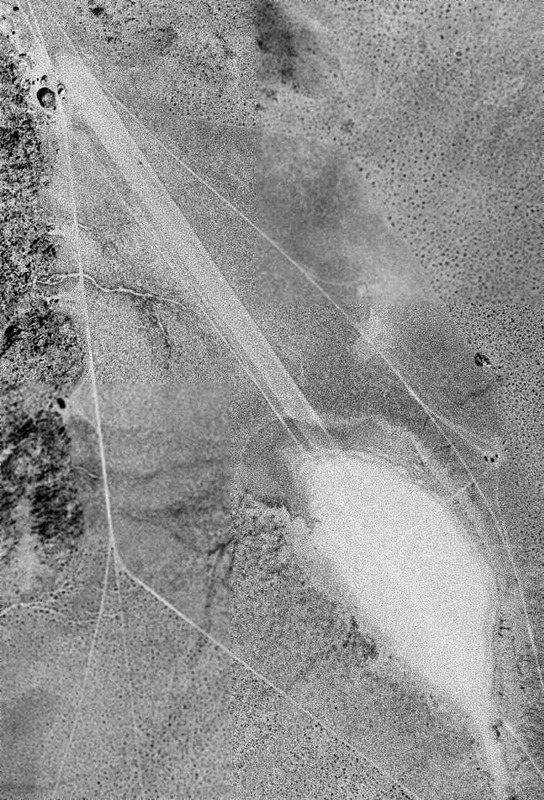 The (LEFT) photo was taken on May 24, 1959 around 12-NOON, the exact minutes are disputed. 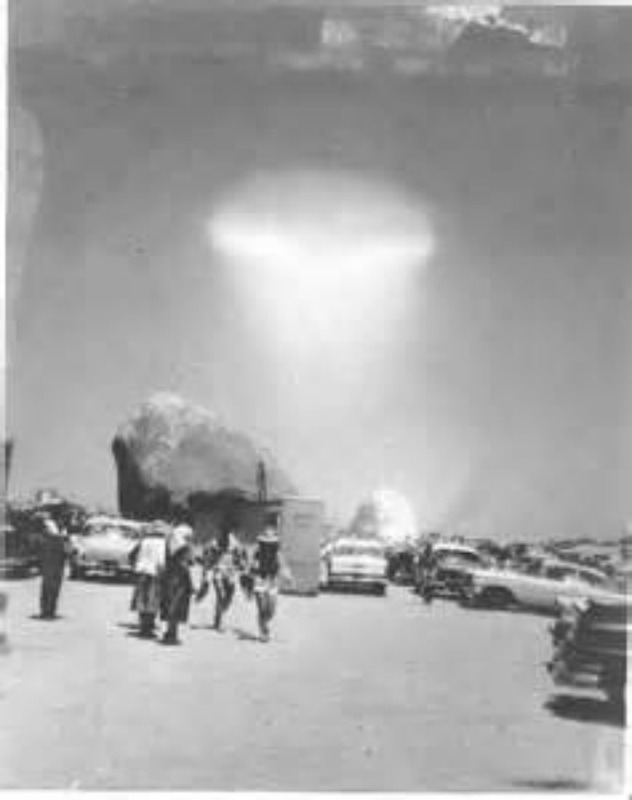 (Officer) Ackerman and the people on the desert floor did not see anything, when this photo was developed their was a UFO in the snapshot. 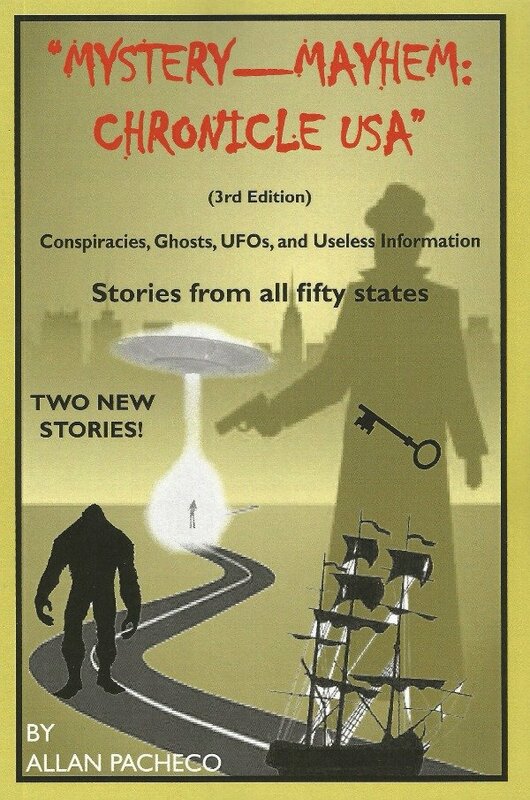 However, some people on the rim of the rocks at the convention claim they saw a UFO. 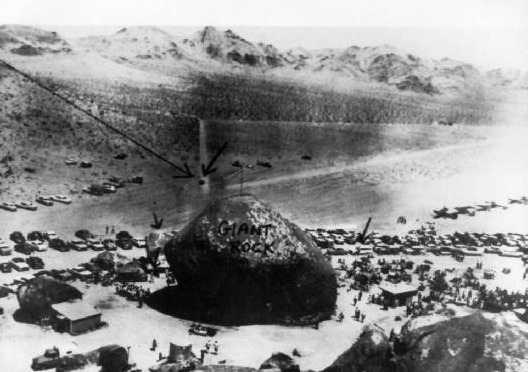 Skeptics claim the photo is question is a lens flair, the believers claim that the UFO could mask itself. 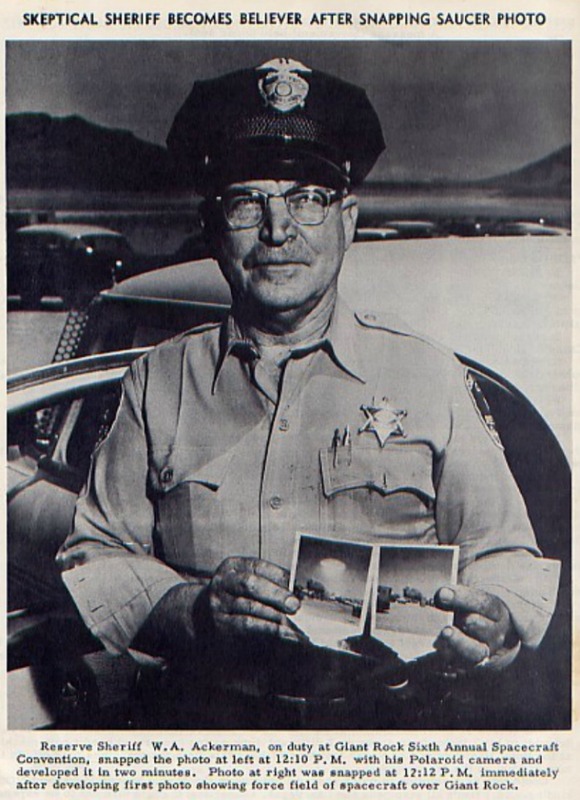 The officer in the photo above this one is Ackerman with the before and after photo. 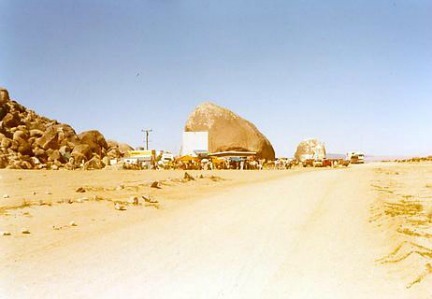 Officer Bud Green who died in 2005 and Jim Velasquez who is walking towards the camera next to the women in shorts, claim that Ackerman had a polaroid camera and developed the photos there at the Giant Rock-- and to Ackerman's surprise he caught something on film. 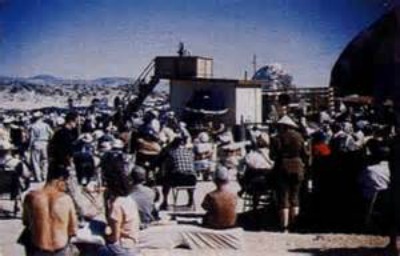 RIGHT: THE GIANT ROCK, LANDERS CALIFORNIA UFO CONVENTION -- IS THE SHINDIG OVER AND THESE PEOPLE ARE HAVING SOME CHOW BEFORE THEY HIT THE ROAD? 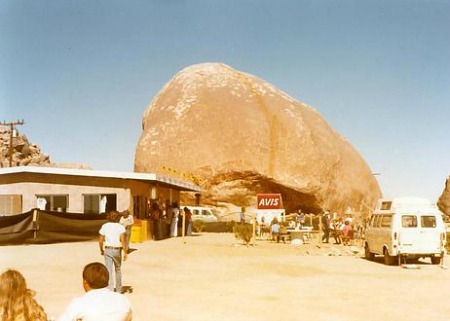 OR THEY CAMPING OVERNIGHT AT THE GIANT ROCK? 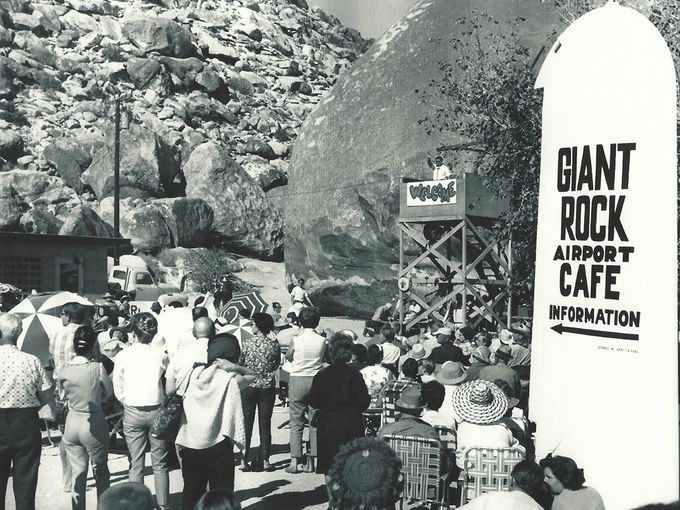 It is now been almost half a century since the Giant Rock hosted a UFO convention. 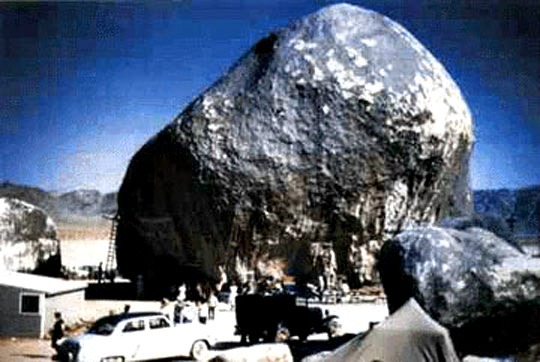 Sadly the Giant Rock is not what it used to be, On February 23, 2000 a large piece of the Giant Rock broke off. What caused this, according to some it was a combination of the heat and a small quake. 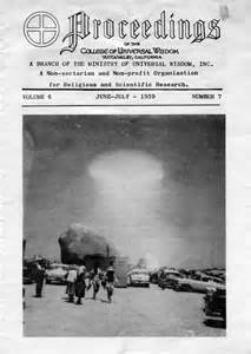 BELOW-UFO convention 1965. 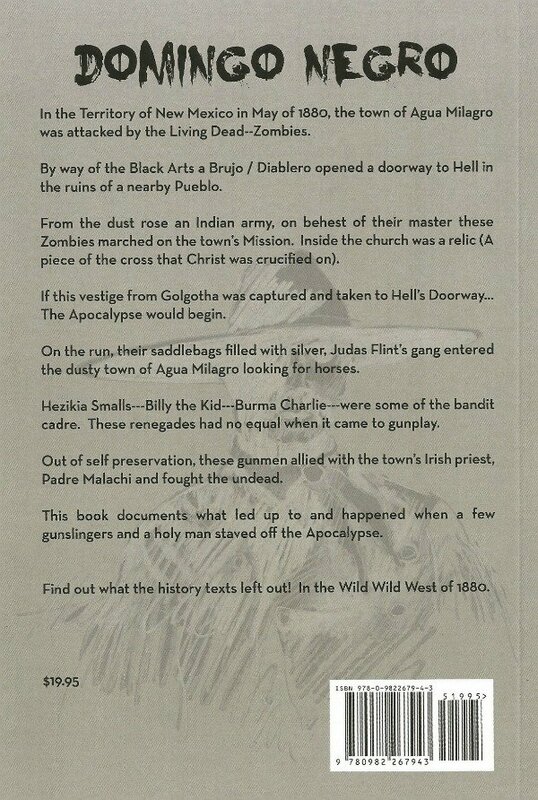 IF YOU LIKE THIS PAGE-- YOU WILL LIKE ALLAN's TOURS OR BOOKS--TO SCHEDULE A SANTA FE GHOST TOUR 505-986-5002 or 505-231-1336. 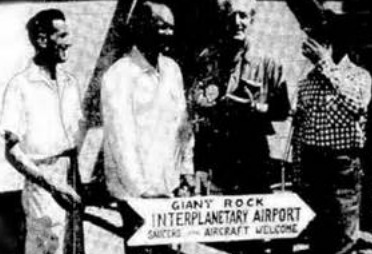 MORE + MORE DATA & PHOTOS on THE GIANT ROCK INTERPLANETARY SPACECRAFT CONVENTION & A AUDIO BY GEORGE VAN TASSEL FROM 1956. 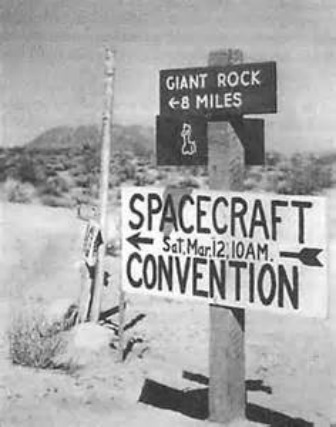 UFO CONVENTION PAGE--CLICK HERE = MORE INTERESTING STUFF FROM THE VINTAGE GIANT ROCK SHINDIGS!